Your company would well and truly be in the minority if its IT systems managed to stay up-and-running 24 hours a day, 7 days a week, 365 days a year, forever and ever. IT systems go offline for a number of reasons: sometimes for planned maintenance and upgrades, other times because of faults and other issues. A 2015 report revealed that North American companies lost up to around $700 billion per year, including a 78 per cent drop in productivity caused by employees being offline. So you’ve decided to communicate with your employees to let them know in advance about scheduled maintenance that will cause your computer networks to be unavailable. Or perhaps an unexpected outage has taken place and you need to quickly alert employees. But what do you need to say? Like any communication, being clear and concise is important. Make sure you cover off all the important facts so that you can eliminate any confusion and leave your staff feeling confident about what to expect. It’s essential that you let your employees know as soon as possible that there is an issue and that IT staff are working to resolve the problem. If you have an estimated restoration time, include that so people know what to expect. With any communications, you should always endeavor to answer the main questions of who, what, where, when, why and how. What: the problem affecting your network. Why: how the problem came about (if known). Where: which locations is it affecting? Who: which staff/users is it affecting? How: what actions to employees need to take, if any? When: what are the timeframes involved in rectifying the situation? You don’t need to include detailed technical information for your basic users, just the facts that are relevant to them to assess what the system outage means for their ability to do their work. It’s important to sound professional, but not overly technical, when communicating about an IT outage with your staff. Don’t be condescending, but at the same time don’t try to be funny or sound “hip”. Your employees would prefer if you sound like you are in control, but empathetic. After investigating the cause of an outage it can quickly become apparent that the estimated time to restore service is significantly longer than you had previously estimated. You need to send out a further notification to advise staff of the changing situation. Repeat this as often as necessary: these situations can change quickly. And if there’s nothing new to report, you should still reach out to staff after a period of “silence” so they can be assured that you are still working to rectify the situation. The impression can be that staff have been forgotten about and are being kept in the dark. By sending additional communication it shows that you value them and want to keep them in the loop. Your aim is to foster trust, while at the same time you are freeing up help desk staff from answering calls and giving the same answers repeatedly to employees who have grown impatient. How to deliver IT outage notification? When you have sound and reliable internal communications systems and procedures in place, you’re on the front foot when it comes to mitigating risks when your systems go down. DeskAlerts is the best internal communications solution for the job. Many IT departments in organizations around the globe have turned to DeskAlerts to notify employees about network outages that affect their productivity. 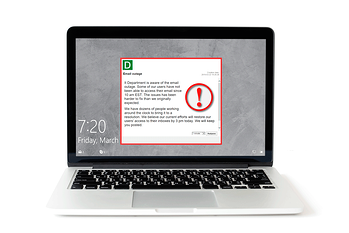 DeskAlerts allows you to send messages to your employees’ desktop screens in the form of a pop-up notification window. No matter what software applications your staff are using at the time, DeskAlerts will get their attention in a way that is more reliable than sending an email. Messages are sent even if screens are locked or on screensaver mode, and can’t be ignored or minimized. Giving people notice of planned outages for maintenance and upgrades mean they can plan their workloads better and schedule tasks for that time that don’t rely on access to the network. This means productivity won’t be too badly affected. DeskAlerts allows you to schedule your notifications ahead of time. When it comes to communicating about planned outages, this is a useful feature. Reminding employees several times in advance is a good idea and will help ensure the message gets through. You can send messages to every single employee at once, or just target a selected group of employees. For example if you know the network is going to be down in only one geographic region, or software that a particular cohort of employees use, you can send messages to only those who are affected. This means that staff who aren’t affected will not be bothered or confused by your messages. When the unforeseen eventuates, you can use DeskAlerts to keep your employees informed, so long as there is network access to use the system. For example if only email and internet is experiencing an outage, you can communicate with your employees letting them know what the problem is and when you anticipate there will be a resumption of service. You can keep staff informed throughout, advising whenever there is a change in status. 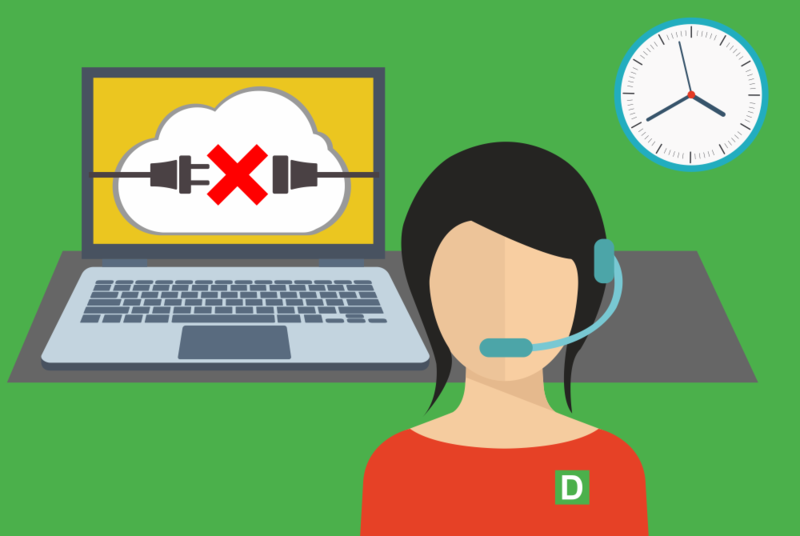 By using DeskAlerts to communicate with your employees, you will take pressure off your IT help desk, allowing your IT staff to be freed up to get on with the job of restoring your systems.